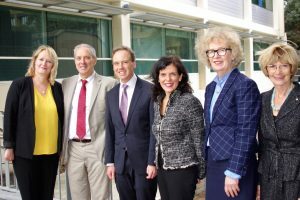 The Federal Minister for Health, the Honorable Greg Hunt MP, announced a further funding commitment of $6.1M to Monash Partners Academic Health Science Centre. In making this announcement the Hon Minister Hunt was joined by Federal Member for Chisholm, Ms Julia Banks MP and several of Monash Partners Council members and Theme and Platform leads. Benefiting from this round of Medical Research Fund funding, young Tanvir Bhangu joined the Minister at the announcement. 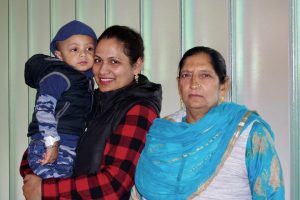 Monash Health patient Tanvir with his mother and grandmother. 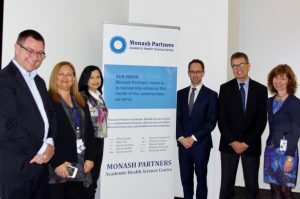 You can find out more about the Monash Partner funding, here. L-R: Professor Helena Teede, Mr Andrew Stripp, Ms Julia Banks MP, Professor Christina Mitchell, Ms Barbara Yeoh, The Hon Greg Hunt MP at the Medical Research Future Fund (MRFF) $6.1M announcement. 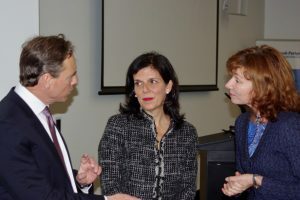 The Hon Greg Hunt MP with Julia Banks MP and Associate Professor Jacqueline Boyle. L-R: Professor Jim Buttery, Professor Helen Skouteris, Professor Jayashri Kulkarni, Professor Anton Peleg, Professor Grant Russell and Associate Professor Jacqueline Boyle.